Sky Jack Morgan: Have You Seen THE CRAZIES? Have You Seen THE CRAZIES? It's really good, and I can see why it's getting such good reviews. I saw it last night with my friend Jeff in Harrisonburg, which happens to be the only place in 50 miles playing the film. I'd think that they would market it in small city areas more aggressively since it takes place in a small town, but I'm not sure what film production companies are up to these days. 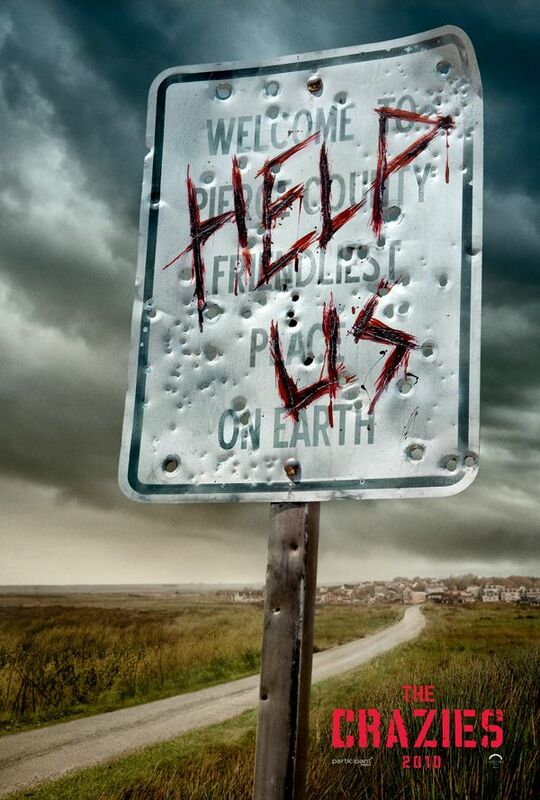 It's a remake of a Romero film, and George A. Romero produced it, and that means it's got to be at least pretty good. The zombies are super scary, though not pure Romero-style. They're kind of a mix between Return of the Living Dead and 28 Days Later. They're fast, they're ugly, but sometimes they're smarter than you'd expect. The characters are amazingly well-developed, considering that the action begins in the first scene of the film. The story is believable. The relationships are as real as can be. There's even a scene in which the soldiers are humanized, and it's touching. Nothing is known about how "the virus" is passed from one person to another. The problem with the virus-turns-us-to-zombies bit is that we all know a little too much about viruses at this point to play it fast and loose. Dude stabs a zombie in the neck with a knife that has passed through the back of his hand, mixes all up in the zombie lady's blood, and he's not infected by the end? Come now, I can understand not having full-blown zombie, but at least Z.I.V. and a hunger problem? If the military was going to kill everyone indiscriminately from the beginning, why bother with the ruse of sending a bunch of soldiers in to sweep the town, risking the secret getting out? I mean, they put boots on cars, separate families, tie people to beds, and then they torch the healthy people anyway and light the place up with a sub-nuke. Wha? Seems like they could have saved themselves some trouble. Speaking of the military, I know that militariness is a major part of our lives these days, but I'm kind of bored with military stuff being in every movie I see. Everywhere I look, there are killing machines and the military "controlling us" stories. Are we really that afraid of soldiers these days? Remember when every movie was about clones? Before that it was robots. Before that it was diseases. Before that it was space-threats. Now everything's about soldiers killing people. It's getting tiresome. I totally recommend it, though.